Mayor Lomax wants Dante to convince Olivia to drop the case. Dante says he backs his mother. Lomax makes a veiled threat about canceling some program Dante&apos;s interested in. Dante threatens to report her. Olivia&apos;s having second thoughts about the lawsuit because of the bad publicity, until a woman approaches her and commends her for taking a stand. Lulu wants Maxie&apos;s help in getting Dante back. Lulu says she needs a key to the loft since she got rid of hers. Maxie tells her to check with Olivia. Sam thinks Kristina should tell Alexis the truth about college, but Kris refuses. Sam mentions talking to Franco about Jake. Kristina warns her not to get in the middle of things. Talk turns to Kris&apos; situation with the professor. Sam wonders what Kris isn&apos;t telling her. Franco wants to see Jake more often, but Liz wonders why things are so urgent. Franco lets it slip that he spoke to Sam about Jake which angers Liz. She tells him to mind his own business. Jason questions Jake about the pictures. Jake claims the bad woman is from a video game and not real. Lulu approaches Olivia, who&apos;s not happy about the impending divorce. Lulu says she wants to fight for her marriage and needs Olivia&apos;s help. Dante updates Olivia about Lomax&apos; visit. Dante mentions Lulu and the divorce papers. Olivia tells him to take more time to think about things. Lulu shows Maxie the dress she&apos;s wearing to get Dante back. Lulu feels that love conquers all and she can get that with Dante again. The two find the divorce papers, but Lulu notices that they aren&apos;t signed. Jason shows Liz the picture and feels Jake needs immediate help, which Franco overhears. Jason warns Franco to back off, but Liz wants to hear his theory. Franco shows them Jake&apos;s drawings. Franco says Jake is acting out and Jason realizes that Jake is behind all the shenanigan. 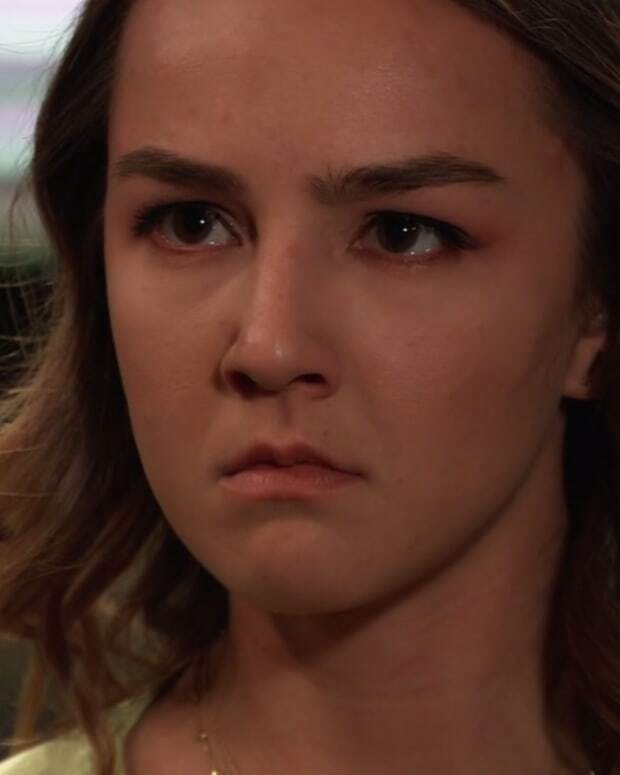 Alexis wants to know what&apos;s going on with Kristina, but she just says she&apos;s happy about the wedding and promises to be there. As Kristina&apos;s leaving, Professor Parker in all her female glory, shows up. Mayor Lomax tells Olivia that city functions that were to take place in the hotel are now cancelled until the lawsuit is dropped. Dante gets home to Lulu who says she wants to save their marriage. Sam decides to pay Liz a visit to discuss Jake and finds him with a broken window and cut finger. Sam points out that the glass is on the outside and accuses Jake of breaking the window. Jake runs into the basement. Sam follows him and manages to fall down the stairs. Things I learned today: Jake apparently has a clotting disorder, since he barely touched the broken glass and immediately started bleeding profusely!! Also, Sam doesn&apos;t understand how to turn on lights in dark basements or how stairs work.